Alan Kenneth Mackenzie Clark (13 April 1928 – 5 September 1999) was a British Conservative Member of Parliament (MP), author and diarist. He served as a Junior Minister in Margaret Thatcher's governments at the Departments of Employment, Trade and Defence. He became a privy counsellor in 1991. He was the author of several books of military history, including his controversial work The Donkeys (1961), which inspired the musical satire Oh, What a Lovely War! Clark was a keen supporter of animal rights. Clark was born at 55 Lancaster Gate, London, the elder son of art historian Kenneth Clark (later Lord Clark), who was of Scottish parentage, and his wife Elizabeth Winifred Clark (née Martin), who was Irish. His sister and brother, fraternal twins Colette (known as Kelly) and Colin, were born in 1932. At the age of six he matriculated as a day boy to Egerton House, a preparatory school in Marylebone, and from there at the age of nine went on to board at St Cyprian's School, Eastbourne. Clark was one of the seventy boys rescued when the school building was destroyed by fire in May 1939. He was relocated with the school to Midhurst. In September 1940, with the Luftwaffe threatening south east England, the Clarks moved their son to a safer location at Cheltenham College Junior School. From there he went to Eton College in January 1942. In February 1946 while at Eton he joined the Territorial training regiment of the Household Cavalry based at Windsor, but was discharged in August when he had left Eton. He then went to Christ Church, Oxford, where he read Modern History under Hugh Trevor-Roper, obtaining a third-class honours degree. After Oxford he wrote articles for the motoring press before he went on to read for the bar. He was called to the bar in 1955 but did not practise law. Instead, he began privately studying military history with a view to professional writing on the topic. Clark's first book, The Donkeys (1961), was a revisionist history of the British Expeditionary Force's campaigns at the beginning of World War I. The book covers Western Front operations during 1915, including the offensives at Neuve Chapelle, Aubers Ridge and Loos, and ending with the dismissal of Sir John French as Commander-in-Chief of the BEF, and his replacement by Douglas Haig. Clark describes the battle scenes and criticises the actions of several of the generals involved in the heavy loss of life that occurred. Much of the book is based on the political manoeuvres behind the scenes as commanders jostled for influence, and Sir John French's difficulties dealing with his French allies and with Herbert Kitchener. Haig's own diaries are used to demonstrate how Haig positioned himself to take over command. The publication sold well, and is still in print 50 years after its first print run, being regarded as an important work on the British experience of the World War. The book's title was drawn from the expression "Lions led by donkeys" which has been widely used to compare British soldiers with their commanders. In 1921 Princess Evelyn Blücher published her memoirs, which attributed the phrase to OHL (the German GHQ) in 1918. Clark was unable to find the origin of the expression. He prefaced the book with a supposed dialogue between two generals and attributed the dialogue to the memoirs of German general Erich von Falkenhayn. Clark was equivocal about the source for the dialogue for many years, but in 2007, a friend Euan Graham recalled a conversation in the mid-1960s when Clark, on being challenged as to the dialogue's provenance, looked sheepish and said, "Well I invented it." This invention has provided a major opportunity for critics of The Donkeys to condemn the work. Clark's choice of subject was strongly influenced by Lord Lee of Fareham, a family friend who had never forgotten what he saw as the shambles of the B.E.F. In developing his work, Clark became close friends with historian Basil Liddell Hart, who acted as his mentor. Liddell Hart read the drafts and was concerned by Clark's "intermittent carelessness". He produced several lists of corrections which were incorporated, and wrote "It is a fine piece of writing, and often brilliantly penetrating." In more recent years, the work has been criticised by some historians for being one-sided in its treatment of World War One generals. Brian Bond, in editing a 1991 collection of essays on First World War history, expressed the collective desire of the authors to move beyond "popular stereotypes of The Donkeys" while also acknowledging that serious leadership mistakes were made and that the authors would do little to rehabilitate the reputations of, for instance, the senior commanders on The Somme. The historian Peter Simkins complained that it was frustratingly difficult to counter Clark's prevailing view. Professor Richard Holmes made a similar complaint, writing that "Alan Clark's The Donkeys, for all its verve and amusing narrative, added a streak of pure deception to the writings of the First World War. Its title is based on 'Lions led by Donkeys'. Sadly for historical accuracy, there is no evidence whatever for this; none. Not a jot or scintilla. The real problem is that such histories have sold well and continue to do so. They reinforce historical myth by delivering to the reader exactly what they expect to read". Clark's work was described as "contemptible" by the Marquess of Anglesey who regarded Clark as the most arrogant and least respectable writer on the War, but this impartiality of this view may have been overshadowed by the fact that Anglesey's own history of the British Cavalry had been reviewed by Clark with the comments "cavalry are nearly always a disaster, a waste of space and resources." Graham Stewart, Clark's researcher for a later political history that he would write entitled The Tories, noted: "Alan wasn't beyond quoting people selectively to make them look bad". Clark went on to publish several more works of military history through the 1960s, including Barbarossa in 1965 examining the Operation Barbarossa offensive of World War 2; he also tried his hand at novel writing, but none of the subsequent books were as commercially successful or drew the same attention as "The Donkeys" had achieved, and he abandoned the path of military history in the mid-1970s to pursue a professional career in national politics. Completely opposed to the Common Market, Clark joined the Conservative Monday Club in 1968 as an avid opponent of the Common Market, and was soon Chairman of its Wiltshire branch. In 1971 he was blacklisted by Conservative Party Central Office for being too right-wing but after representations by him, and others, he was removed. [clarification needed] He subsequently became MP for Plymouth Sutton at the February 1974 general election with a majority of 8,104, when Harold Wilson took over from Edward Heath as prime minister of a minority Labour government. At the General Election in October 1974, when Labour gained a small overall majority, Clark's vote fell by 1,192 votes but he still had a comfortable majority with 5,188. His first five years in parliament were spent on the Conservative opposition benches. He was still a member of the Monday Club in May 1975. It is unclear when he let his membership of the club lapse but possibly it was upon becoming a government minister. He continued to address Club events until 1992. JP "Did it bother you personally that this British equipment was causing such mayhem and human suffering (by supplying arms for Indonesia's war in East Timor)?" AC "No, not in the slightest, it never entered my head. You tell me that this was happening, I didn't hear about it or know about it." JP "Well, even if I hadn't told you it was happening, the fact that we supply highly effective equipment to a regime like that is not a consideration, as far as you're concerned. It's not a personal consideration." Clark was a passionate supporter of animal rights, joining activists in demonstrations at Dover against live export, and outside the House of Commons in support of Animal Liberation Front hunger-striker Barry Horne. Clark published the first volume of his political and personal diaries in 1993, which caused a minor embarrassment at the time with their descriptions of senior Conservative politicians such as Michael Heseltine, Douglas Hurd, and Kenneth Clarke. He quoted Michael Jopling—referring to Heseltine, deputy PM at the time—as saying "The trouble with Michael is that he had to buy all his furniture" and judged it "Snobby, but cutting". His account of Thatcher's downfall in 1990 has been described as the most vivid in existence. Two subsequent volumes of his diaries cover the earlier and later parts of Clark's parliamentary career. The diaries reveal recurring worries about Japanese militarism but his real views are often not clear because he enjoyed making "tongue in cheek" remarks to the discomfiture of those he believed to be fools, as in his sympathy for a British version of National Socialism. Clark married his wife Jane in 1958 when she was 16; he was 30. They were married for 41 years and had two sons. While involved in the Matrix Churchill trial he was cited in a divorce case in South Africa, in which it was revealed he had had affairs with Valerie Harkess, the wife of a South African barrister (and part-time junior judge), and her daughters, Josephine and Alison. After sensationalist tabloid headlines, Clark's wife Jane remarked upon what Clark had called "the coven" with the line: "Well, what do you expect when you sleep with below stairs types?" She referred to her husband as an "S, H, one, T". Clark died in 1999 of a brain tumor he was convinced had been caused by his heavy mobile phone use. His body was buried in the grounds of Saltwood Castle. Upon his death, his family said Clark wanted it to be stated that he had "gone to join Tom and the other dogs." It was reported in The Tablet that Clark was received into the Catholic Church two months before he died (as his father had been), but had chosen to keep the matter private. Clark's biographer Ion Trewin denied the story, saying that Clark told Westminster Cathedral's Father Michael Seed that he did not wish to become Catholic if his dogs could not also go to heaven. In 1993 he gave a half-hour Opinions lecture, televised by Channel 4, described in his diary as "It was good. Clear, assured, moving. I looked compos and in my 'prime'. Many people saw it. All were enthusiastic. Today acres of coverage in The Times." Bargains at Special Prices (1960). Barbarossa: The Russian-German Conflict, 1941-1945 (1965). The Lion Heart: A Tale of the War in Vietnam (1969). Aces High: The War in the Air over the Western Front 1914-1918 (1973). ^ "Thatcher leads Clark tributes". London: BBC News. 7 September 1999. ^ "Index entry". FreeBMD. ONS. Retrieved 3 April 2016. ^ Evelyn, Princess Blücher (1921). An English Wife in Berlin. London: Constable. p. 211. ^ Trewin 2009, pp. 182–189. ^ Trewin 2009, pp. 153–177. ^ Trewin 2009, pp. 176–189. ^ Taylor, A. J. P. (23 July 1961). "Dairies bring doom". The Observer. London. p. 19. ^ Howard, Michael (3 August 1961). "Review of 'The Donkeys'". The Listener. London: BBC. ^ Trewin 2009, p. 178. ^ Brian Bond, ed. (1991). The First World War and British Military History. Oxford Clarendon Press. pp. 6–12. ISBN 978-0-19-822299-6. ... despite the saturation coverage of the First World War in the 1960s, little was produced of lasting scholarly value because there was so little attempt to place the war in historical perspective; books such as The Donkeys and films such as Oh, What a Lovely War tell us as much about the spirit of the 1960s as about the period supposedly portrayed. ^ Simkins, Peter (8 December 1996). The Sunday Times (London). ^ Holmes, Richard, Tommy, pp. xxi–xxii. 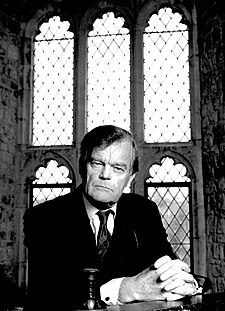 ^ Trewin, Ion, Alan Clark – The Biography, London, 2009, ISBN 9780297850731-I, pps: 230 & 246-7. ^ a b Trewin, p.250. ^ Copping, Robert, The Monday Club - Crisis and After, London, May 1975, p.25. ^ "Real Lives – Channel 4's Portrait Gallery". Channel 4. ^ Arms, David Edmonds The Philosophers; 4, BBC Radio. "The difference between lying and misleading". BBC News. Retrieved 2015-12-05. ^ "Alan Clark: A clumsy war". BBC News. 13 May 1999. Retrieved 23 April 2010. ^ 3 Alan Clark Diaries: The Last Diaries, Page 389, Phoenix Paperback 2003 Edition, 4 April 1999: I am hugely depressed about Kosovo: Those loathsome, verminous gypsies; and the poor brave Serbs. ^ Financial Times 7 February 1985 "Tory minister faces row over race remark"
^ Clark, A. The Last Diaries: In and Out of the Wilderness, Phoenix, 2003, p.219. ^ "Channel 4 - The Real Alan Clark". Channel 4. Archived from the original on 5 July 2007. ^ Pilger, John, Documentary:Death of a Nation: The Timor Conspiracy, 1994. ^ Macnaghten, Phil; Urry, John (1998). Contested natures (1 ed.). London: Sage. ISBN 978-0-7619-5312-8. ^ Clark, Alan. The Last Diaries: 1993–1999. Phoenix, p. 361. ^ Gardham, Duncan (22 September 2008). "Lord Heseltine traces his roots to poverty in Wales". The Daily Telegraph. London. ^ 1 Alan Clark Diaries: Into Power, Page 280, Phoenix Paperback 2000 Edition, 8 December 1981: Frank [Frank Johnson, sketch writer for The Times] pretended he wanted to talk about the Tory Party, but he really prefers to talk about the Nazis, concerning whom he is curious, but not, of course, sympathetic. Yes, I told him, I was a Nazi, I really believed it to be the ideal system, and that it was a disaster for the Anglo-Saxon races and for the world that it was extinguished. He both gulped and grinned 'But surely, er, you mean … (behaving like an unhappy interviewer in Not the Nine O'Clock News after, e.g., Pamela Stephenson had said something frightfully shocking) ideally in terms of administrative and economic policy … you cannot really, er …' Oh yes, I told him, I was completely committed to the whole philosophy. The blood and violence was an essential ingredient of its strength, the heroic tradition of cruelty every bit as powerful and a thousand times more ancient than the Judaeo-Christian ethic. ^ Collins, Laura. "Diarist and womaniser Alan Clark's wife Jane finally speaks out in an extraordinary interview". Daily Mail. London. ^ Dodd, Vikram (12 June 2004). "Coven's footnote to Clark diaries". The Guardian. London. Archived from the original on 7 March 2010. Retrieved 7 March 2010. ^ Lyall, Sandra. "Alan Clark, a British Scold, Is Dead at 71", The New York Times, 8 September 1999. Trewin, Ion (2009). Alan Clark: The Biography. London: Weidenfeld & Nicolson. ISBN 978-0-297-85073-1. Wikimedia Commons has media related to Alan Clark (MP).